Someone asked me the other day how I stay motivated and where I get the ideas for the pieces I create. I didn’t really have a good answer – it’s a matter of focus, I said, and I’m fortunate that I love what I’m doing right now. 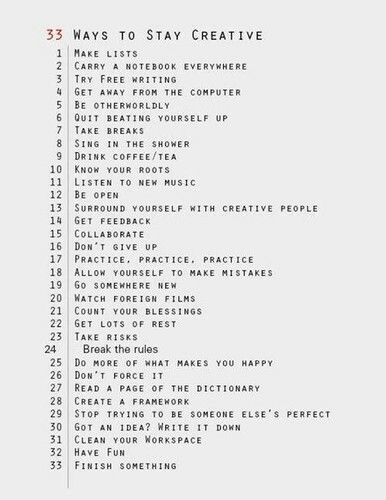 Then, today, I saw this list posted by The Artisan Group on their Facebook page, and I realized that there are a lot of things on it that are already part of my creative process. Since these ideas are useful in any number of endeavors, and since I felt like I owe my friend a better answer, here are some thoughts on what things on this list work for me. [Item 4] The computer is both a necessary evil and a time-sucker. It’s important for me to try and keep this blog updated, and not just because it’s a portal to my work. I process things through my writing, and getting some of it out there so people I know can read and engage with it (and me) is vital to my emotional and spiritual health. I’ve learned this the hard way, but I am not always consistent about pursuing it. (I’m getting better!) The difficulty comes in when I get distracted by my e-mail, or Facebook and Twitter, or the many blogs I follow. It has helped immensely to create specific times in my day when I am “allowed” the luxury of just browsing through things that interest me. [Item 13] I am so grateful that I have so many creative people in my life, in various artistic disciplines. I am part of the worship team at my church, which is filled with some of the most talented and thoughtful musicians I’ve ever met, and our regular time together to prepare for services is a highlight of my week. I’ve also been incredibly fortunate to make a connection with the wonderful people at Wired Designs Studio here in San Antonio, especially owner and director Gail Stouffer, who has been hugely generous with her time and her energy. (I’ve taken several classes there this year, and if I were going to add anything to this list, it would be that. Taking a class in a new technique or process can be a huge jumping off place to new realms of creativity – I highly recommend it!) And finally, the internet is a marvelous thing – through its magic, I’ve been able to connect with many artists whose work I admire and research the work of many more. In particular, I’ve been influenced by Kate McKinnon, Connie Fox, and Brandi Hussey (who has since moved on from jewelry to graphic design) – though there are scads of others working in fabric, graphic design, and photography who really crank my motor. Two things about this that I have found particularly important: first, go outside my own discipline. I’ve found things in photography that spark something in jewelry, and vice versa. Second, I make sure I’m engaging with at least a few people who think, believe, and work differently than I do – this is good intellectual exercise in addition to being important for my creative health. Just because people are working in ways that don’t work for me doesn’t mean there isn’t value in it or something to be learned from it – and from an intellectual standpoint, there is nothing healthy or valuable in residing in an echo chamber. [Items 17 and 18] These two go together – practice and let yourself make mistakes. It took me a long time before I gave myself permission to “waste” materials on something that wouldn’t ever be a viable piece of jewelry. In the process of learning, making mistakes can be more valuable than making successes – and practicing success is important in order to take the next step in growth. [Items 22 and 25] These two go together for me, too. The last few months have been all about both – getting the rest I need, and focusing on the things that fill my cup. For a number of years, I was really running on empty and giving myself permission to stop was a big deal. There’s something that feels a little bit selfish about saying “no” when in fact it’s essential to our survival. “No, I need to take it easy today,” has been really freeing. And “No, I’m not going to do the laundry, I’m going to give myself an extra two hours in the studio” has been likewise freeing. The laundry will be there tomorrow – today, if I need a nap or a float in the pool or extra time in the studio, I’m going to take it. [Item 29] This is huge. This year, God walked me through fire and broken glass to get me to place where I could finally stop comparing myself to other people and worrying about what people thought of me. It was hard but it was so, so worth it. No one else’s version of perfect will ever fit me the way God’s version of me will fit me. I’m pursuing that and nothing else – and that’s freedom. So in my creative process, while I take lots and lots of inspiration from other artists, I pursue pieces and techniques that work for me. As Gail Stouffer says, the point is to be successful in making the thing you want to make. Who cares how you did it? And when I hear people suggest I should focus on things that are more “in fashion” or “trending” I mentally run in the other direction. I’m interested in what comes organically out of the meditative time and effort I have in the studio – and if it’s never “trendy” so be it. [Item 31] When things get too cluttered, I shut down – I can’t create in a space that isn’t appealing to me. The other benefit is that when I finally get around to re-organizing stuff that’s gotten out of hand, or putting things away, or sorting through an overflowing container, I frequently find some beautiful thing I forgot I had – and that sparks new ideas. [Item 33] I laughed when I read this one. I usually have four or five unfinished pieces on my worktable at any given time, because I get distracted in the middle of working on them and move on to something else. 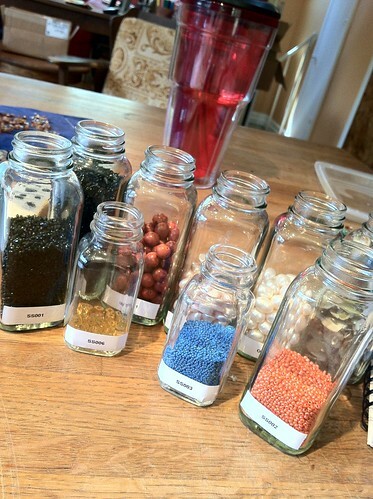 Yesterday, I forced myself to finish all the unfinished things I had out – and to log into my inventory software all the things I bought at a bead show over the weekend – before I was allowed to “play” with anything new. In the process of finishing two necklaces, I got ideas for several more. So what works for you when you need to stoke the creative fires? How do you get past a block when you can’t find the motivation for the next step?